When is the best time to book the work Christmas party? One of the most commonly asked questions that we hear as professional event organisers has to be when is the best time to book the work Christmas party? We always recommend booking your tickets as soon as possible and there are a whole bunch on benefits for doing so that you might not even know about. Setting a Christmas party date that the majority of your colleagues can attend is often a time consuming and frustrating task. Because we’re realists, we know not everyone is going to be able to make the same date. So, imagine finally settling on a date after weeks of sending out doodle polls and email reminders to find out when everyone is available for the Xmas party, only to be told that your date is completely sold out. That’s a huge amount of time and effort wasted. So how do you avoid that disappointment? Don’t leave it to the last minute! A lot of Christmas parties tend to be announced around April and May. 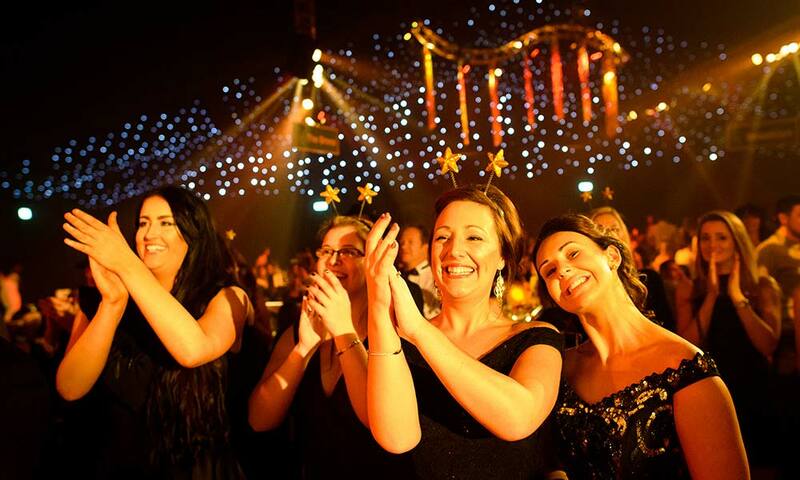 We know that might seem ridiculously early but when you take into account that some venues have a capacity of 3000+ and thirty Christmas parties taking place between late November and December, you’ll appreciate that a lot of planning and organisation is needed in order to make those events successful and memorable. Bearing in mind when these parties go on sale to the general public, we recommend you start looking into booking your work Christmas party around the summer. Thursdays, Fridays and Saturdays tend to be the most popular Xmas party dates and can sell out months in advance, so if you’re planning your work do for one of those prime dates for a large groupmof people then you really need to be booking your party as close to summer as you can. Another reason why the best time to book your work Christmas party is months in advance is because organising an end of year celebration isn’t always quick and easy. We know from working with thousands of clients over the years that planning a Christmas party is stressful and doesn’t always pan out the way you imagined it. On top of finishing all of your work on time so that you can enjoy your Xmas holidays without the nagging thought of that report you didn’t quite complete, do you really need dietary requirements, food allergies and drink orders looming over you as well? We thought not. Get all of those nitty-gritty details signed off early so that you don’t have to collect that information in the midst of the December chaos. So what are the other possible benefits to booking the work Christmas party so early in advance? By booking early enough, some venues and parties may offer you a small discount or an incentive to secure your booking. 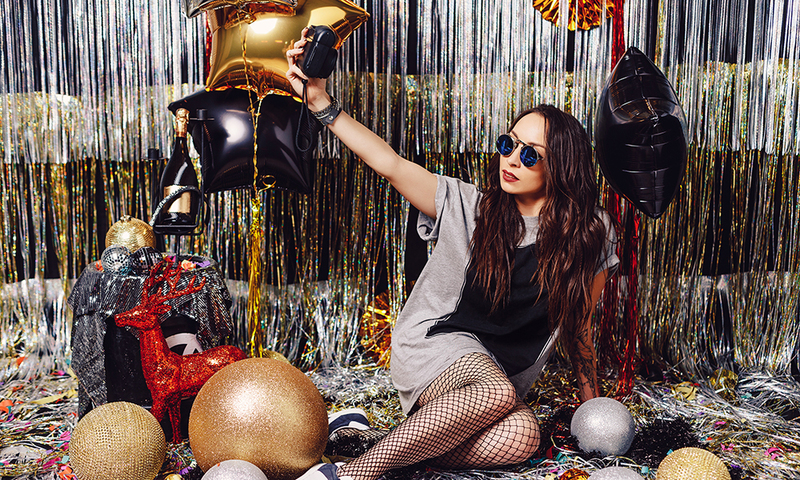 You might be offered a few bottles of complimentary bubbly for each of your tables, extra dodgem tokens (should your party include the good ol’ fashioned bumper cars), or even free professional photographs to hang in your office so that your company can remember your party antics for years to come. An additional bonus of booking your Christmas party sooner rather than later is that you may be seated closer to the stage so that you have front row seats for the extravagant performances set to take place. Alternatively, if you don’t like queueing for your winter cocktails you could also request to be seated next to the bar. By booking last minute, you don’t have these options and we know from experience it’s the little touches that make your Christmas party that extra bit special and memorable. You may also like: What makes a good event? What happens if you book your Christmas party and you want to add on extra guests at a later date? The important thing to remember is that all tickets are subject to availability. Event organisers cannot hold or secure tickets without a deposit or full payment. This means that there is a risk that there might not be any tickets on your party date left over for last minute bookers. If you book your party early, you’ve got a bigger time frame and better chance at there being a few extra tickets available for those friends and colleagues that decide they don’t want to miss out on the Christmas celebrations after all. For those of you hiring a venue exclusively, you might also be wondering when the best time to book your entertainment is. As with the party it’s best to book as soon as you have your venue and date confirmed. You probably aren’t going to be the only company booking entertainment for that date but you’re definitely going to want to be one of the first. If we haven’t already emphasised enough in this blog, the best time to book your work Christmas party is without a doubt a few months in advance – aim for around August. It’ll save you a ton of stress, you might get a discount on your booking, a few extra glasses of champagne, potential front row seats for the live performances, and you can enjoy the lead up to the party without the worry of having to organise it last minute. If you’re in charge of booking your Christmas party this year and you don’t know where to start, get in touch with us, Christmas Connections! We’re a free party finding service and our mission is to relieve you of all of the hassle and stress or arranging your Christmas party. Top on our list of aspects which make a great event is good planning. In order for an event to run smoothly, you need to plan carefully, ensuring you are organised from the very beginning planning stages, right through to the end. You need to make sure you know exactly what is going on and when so there are no mishaps and make sure your time-keeping skills are up to scratch. Detail each task you must do and write down how long they should take and don’t spend too much time on one thing. With planning, attention to detail is paramount – from details such as ensuring the correct time and date, to numbers for orders and other items. Planning is key! One thing which can take an event from potential disaster to a truly great event, is the ability to innovate and adapt to different situations. These can be anything from something slipping up in the planning stages, to something going wrong on the day. With the right skills and quick mindset to adapt to a situation you can quickly turn a potential disaster into something successful. Connections are such an important aspect of any business and come particularly in handy when planning an event. And we’re not talking Twitter followers or people you’ve engaged with on LinkedIn, for a really great event, you need connections you’ve met in person and forged a working relationship with. A vital component to events and meetings, be sure to make the most your time at other events and conferences by building relationships with fellow professionals and those who might come in handy for your own future events, such as attendees, vendors, exhibitors and planners. Speakers are often a great draw when it comes to events, so be sure that whether you have multiple speakers or just one, that they are a good support for the event. Be sure to take the time to find someone who is exactly right and on the day be sure they are able to agree to and follow speaker guidelines that you set, such as time limits. If there is time and budget for this, extra activities can be great to create and cultivate the event experience for attendees. Extra activities can be anything from putting on a food spread, to giving out awards, photo booths or business stalls. This can be a great way to get people more involved and immersed in the event, staying longer and have an overall better experience. Be sure to get this booked in well in advance to ensure there are facilities to cater for this and that your event goes as smoothly as possible. 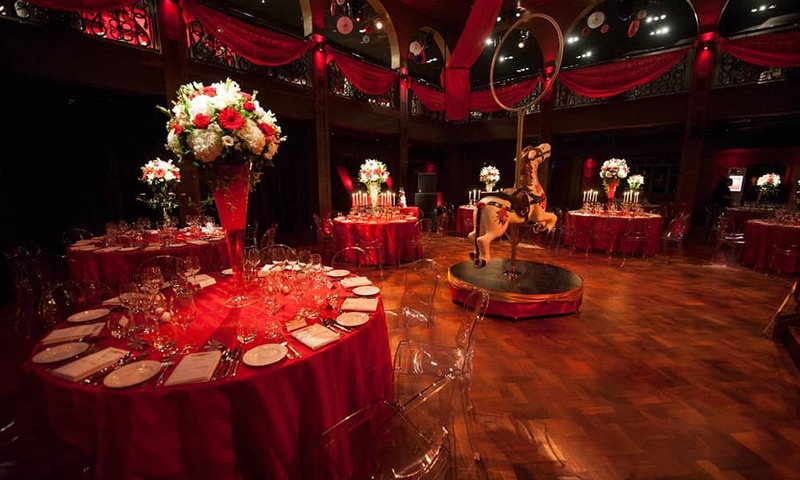 The venue and location of your event is one of the most important decisions to making sure it runs smoothly. And it’s important to tick both boxes – you could have a perfect location, but if it’s miles away with no parking it’s going to cause a nuisance for guests. Similarly, if you have a great location, but unsuitable venue, it won’t work either. Think carefully about where your attendees will be travelling from and factor that in. 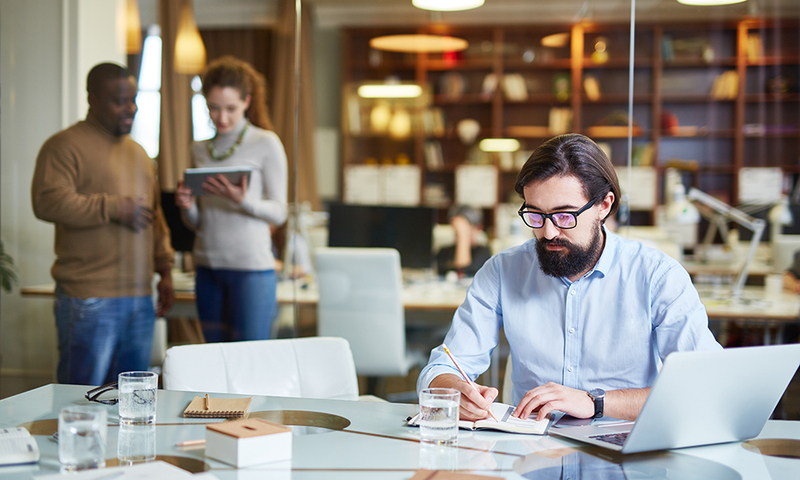 You will also need to think of certain facilities and if it has that – whether it be free Wifi, catering facilities, on-site parking, conference rooms, it is vital that these things are ticked off first. When planning an event it is important that information and communication are clear and precise. You need to ensure that everyone from attendees to sponsors, exhibitors and staff of the venue know timings and what is happening on the day – before the day rolls around. If the event will have extra costs for wifi, a cash-only bar or parking which has to be paid for, be sure people know these details to avoid any nasty surprises on the day of the event. Events are great when run smoothly, and with these easy tips to help tell you what makes a great event, you’re sure to provide your guests with a memorable day. Be sure to plan well ahead and know just what your guests will be after on the day, ensuring you provide them with this. Be clear and concise with your information and follow up with your guests after the event to see how they found it and if there is anything they feel could be improved or changed next time. This will ensure they feel valued and cared for and if there were any aspects they weren’t so keen on, you can improve on this in the future. Hosting a party can seem like a daunting challenge particularly when there are large numbers of guests involved, all with different tastes and interests. This is why it’s important to start your event preparations as early as possible so that you have plenty of time to address any complications that arise. 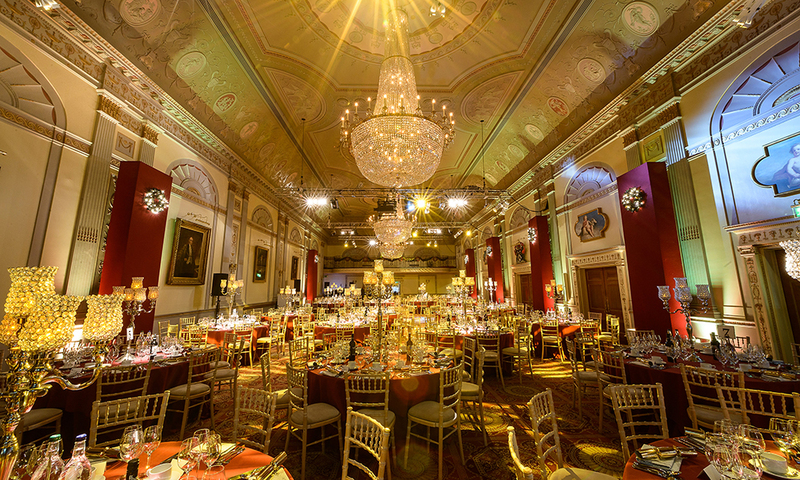 You need to decide what the nature of your event is going to be and then find a venue that meets your requirements. You need to be thinking about how many people are going to attend and whether the venue you have in mind will hold those guests. Some venues will lend themselves to a unique theme. For example, if hosting in a waterfront destination you might want to consider serving a seafood-themed menu. You also need to pay careful attention to the weather if you’re catering to a party that’s outdoors. Should you be under a marquee and an unexpected spell of wind and rain strikes it’s definitely going to dampen the mood. We have a free venue finding tool that you can use. When it comes to food catering it might be worth considering a simple buffet option for larger groups as this can be prepared in advance quickly and easily. Or you could look into hiring out a food van with options such as fish and chips or pizza on the go. This not only feeds everyone but also includes the novelty factor too! If you’ve got more time and resources then a set menu with multiple choices for guests is a winning option. Give just a couple of choices to avoid it becoming too complex and be sure to make note of anyone with dietary requirements or allergies. It’s usually advised to offer a meat or fish option and a good vegetarian option as this generally covers most bases. Have you thought about canapes too? Who doesn’t like a nibble on entry? 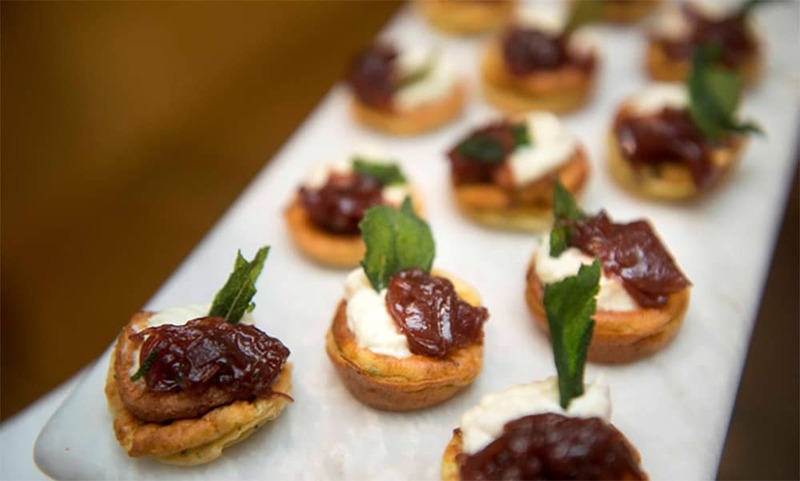 Canapes are relatively easy and cheap to do so it’s worth looking into! You’ll need to check in advance what sort of catering options the venue is suited for. Smaller venues may have limited cooking facilities and some might have restricted storage spaces or insufficient space for food prep. 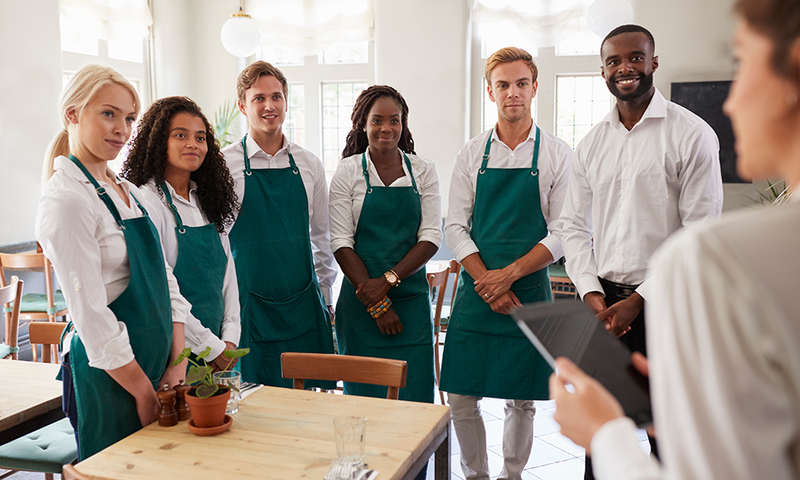 Whether you are catering a party yourself or hiring a company to do it, it’s important to check this out as soon as possible to avoid unnecessary drawbacks. Be sure to also decide the layout of your venue (if this is something that you can control.) When deciding where to put up the bar area try not to make it too close to the front door as it can create a frustrating bottleneck when people arrive. Think also about if you would like a champagne and canape reception when deciding how to cater for a party. This can be a nice touch and make people feel that extra bit special on the night, plus the fizz is a great added way to get people in the mood to party! Don’t forget to calculate how many glasses you want to give per person and work out how many bottles you will need. Take into account some will opt for a sneaky extra glass so be sure there is more than enough to go around so nobody misses out. 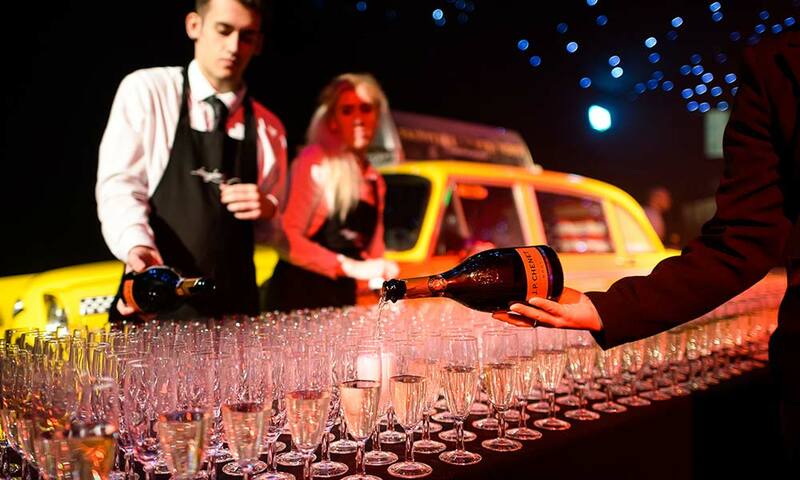 Another top tip for how to cater for a party is to never underestimate the power of a list! Write down which guests will be attending and their dietary requirements. Be sure to specify if they can bring a plus one or not because you don’t want uninvited guests who you haven’t planned for showing up on the day. Create a calendar and assign tasks to specific days, and be realistic with yourself when setting deadlines as it will only stress you out if you’re not. When planning for the actual day be sure to allow enough time for food preparation and things such as washing dishes (if you are doing this yourself) and packing the food for transport. These are often activities which if you are doing yourself can be dismissed as a quick chore or even forgotten, but in actual fact they can take up a fair amount of unplanned time. Be sure to also figure out how much food you will need per person. When preparing a set menu it’s easy to keep count when you’re serving for example, one burger or piece of fish each, but you will also need to calculate the numbers of sides such as potatoes or vegetables. A lot of caterers get around this by assigning set quantities per person. For example, 60g of vegetables and 90g of potatoes. This makes it easier to work out how much to purchase and won’t leave you with half-empty plates being served or sacks of potatoes or vegetables left over at the end and unnecessary expense spent. If you are hiring help for your party then be sure to check reviews in advance to ensure they are reliable and also to factor this cost in when budgeting for your event. This is one of the most important things to think about when it comes to how to cater for a party, so it’s best to source your outside help sooner rather than later. Equip them with a copy of the menu in advance so they are well aware of what is expected and also be sure to give precise instructions for the day. If you want to set a strict dress code – such as black and smart – be sure to outline this prior to the event, and if you want an aspect of your party conducted in a specific way, such as the food laid out in a particular fashion, make sure these instructions are clear and understood. It’s a good idea to provide your external help with a timeline of the event so they’re well rehearsed and prepared for the event ahead. If there is one thing to take from this blog on how to cater for a party then it’s to be prepared well in advance. Figure out early the main components such as venue, numbers, food type, canape reception months in advance so the finer details can be fine-tuned nearer the time. Stay organised, keep it simple and remember the main goal is for the guests to have a good time. You’ll be an expert at how to cater for a party in no time.